According to Fran Lebowitz, “If you read a lot, nothing is as great as you’ve imagined. Venice is – Venice is better.” Although she did not mention Rome, Rome is the same-even better than you imagine. And no one brings you Venice & Rome like Monograms! So stop imagining and join us on this Italy vacation. We’ve arranged your hotel reservations, daily breakfast, sightseeing, connection between the cities, and transfers from/to your hotels to/from the train stations. Plus, Venice & Rome have so much to offer-historical monuments, ancient ruins, amazing cuisine, world-class shopping, and educational and fun walking experiences-that we know it can be overwhelming. That’s why we’ve also arranged the services of a Monograms Local Host®, a one-of-a-kind feature to make sure you have a “friend in the city” who will answer your questions, offer you suggestions, and be there to help make sure your Italy trip runs smoothly. And did we mention your Italy trip includes first-class transportation between the cities via high-speed train? We’ve even included transfers to/from the train stations. Plus, for someone unfamiliar with the train system, it can seem intimidating, so your Local Host will be there with you to help make sure you get on the correct train! 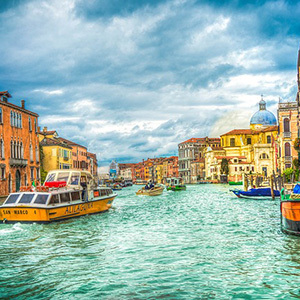 Between the transportation and transfers we’ve included, the sightseeing and guides we’ve arranged, and the hotels we’ve booked, this Italy trip will be better than you imagined-just like Venice!